Poconos Vacation and Travel Information -- Poconos mountains of Pennsylvania -- Vacation guide in PA.
Baltimore Professionals: News on Lawyers, Veterinarians, Doctors and Dentists in the City of Baltimore. Pennsylvania Lumber Museum: The Pennsylvania Lumber Museum is a place the whole family should go to. Not only is it fun-filled, but the history behind Pennsylvania’s lumber industry will answer all the questions you have had about the development of the state. After all, 90 percent of Pennsylvania was wooded before the settlers moved in. Essentially, this museum is a “must-see” for those proud of their state. Blue Mountain Vineyards, located in New Tripoli, is a bit different from the other wineries, in that its tasting room is large and styled after California wineries – it has open beams and windows. You can look through an observation area to the tankroom below the tasting room. Horseback riding in the Poconos is really a good way to see the natural wonder of this area. Whether you ride through woods, streams, or meadows, you'll get a close-up glimpse of the natural beauty of the Poconos, and you'll probably see some of the native birds and animals, too. Paintball. It was created before most people that play were born, but in recent years the extreme game has found a revitalization as paintball fields pop up around the nation. Those who love the game will drive for hours to play at a new field to test their skills against the locals. Or maybe to just light up a few newbs. If you happen to be in or around the Pocono Mountains, there are two fields you shouldn't miss. The Poconos is a mountain and lake filled region that spans 2,400 square miles. The Poconos is an amazing spot to travel through and vacation at. Millions of tourist choose to vacation at the Poconos each year. There are numerous Poconos vacation homes, hotels, motels and bed & breakfasts to stay at throughout the Poconos area. Events, festivals, amusement parks, hiking, fishing, hunting, skiing, boating and golf make the Poconos the perfect place to travel to year around. The Poconos offers tourists an affordable place to travel to with endless places to explore. 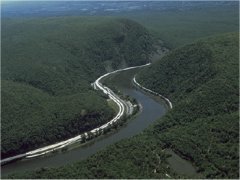 The Poconos is located two hours from Philadelphia and an hour and a half from New York City. Some of the things you should make sure not to miss while visiting the Poconos are the Tannersville cranberry bog, the Delaware Water Gap, The Nascar International Poconos Raceway and the Poconos State Park. The Pocono mountains has so many attractions to offer for your family on their next vacation in Pennsylvania. Take your travel group to some of the many Pocono travel attractions or go sight seeing in the mountains for the weekend. The Poconos is the perfect location for your next family vacation.